Kira Merkle (14) and teammate Sydney Krane go up to try and block an Oakwood kill, Sept. 6 in a girls high school volleyball match at Bellbrook High School. Merkle had a match-best 12 kills to go with three aces in the Golden Eagles win. Bellbrook’s Dani Westbrook (7) blasts a shot over the Jills defense in the opening set of Thursday’s Southwestern Buckeye League Southwestern division match at Bellbrook High School. Bellbrook’s Mara Neal (4) celebrates her birthday with a spike through the block try by Oakwood’s Ellie Jones (55) and Molly Beutel (53), Sept. 6 at Bellbrook High School. 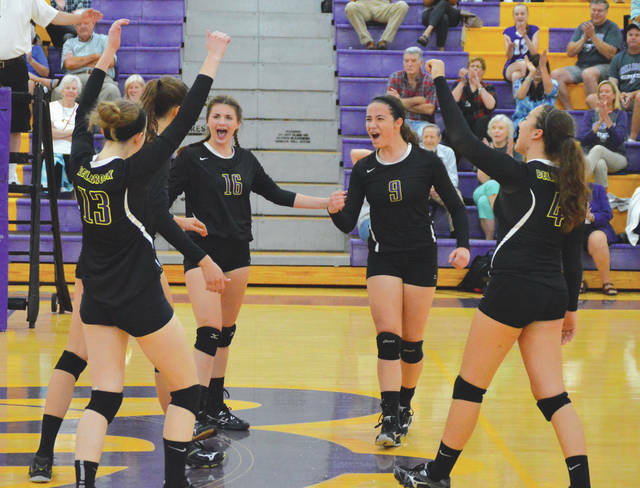 The Bellbrook team of (left to right) Sydney Krane, Kira Merkle, Julia Martin, Bethany Ulring and Mara Neal celebrate a late-match score against visiting Oakwood, Sept. 6, in the Golden Eagles’ three-set sweep at Bellbrook High School. 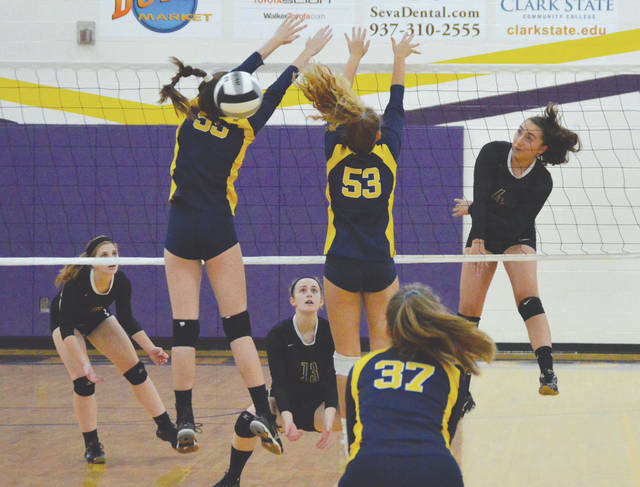 BELLBROOK — Well-balanced Bellbrook simply wore down visiting Oakwood in a girls high school volleyball match on Thursday night, Sept. 6. 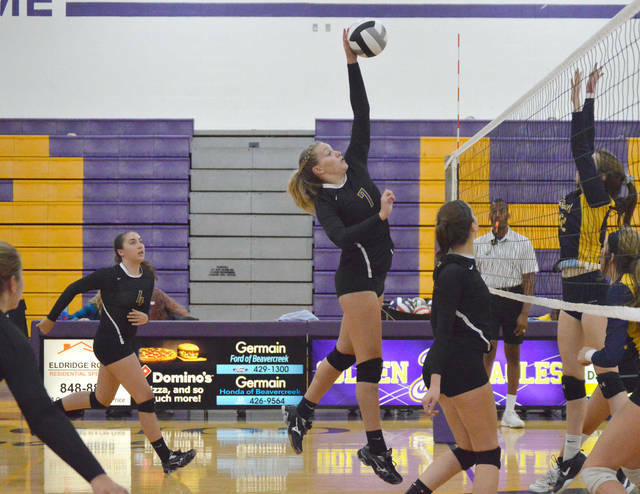 Host Bellbrook jumped out to early leads in all three sets of a 25-16, 25-11, 25-8 Southwestern Buckeye League Southwestern division win over the Jills. Future Ferris State University Bulldog Kira Merkle dominated play at the net with a match-best dozen kills to go with three service aces. 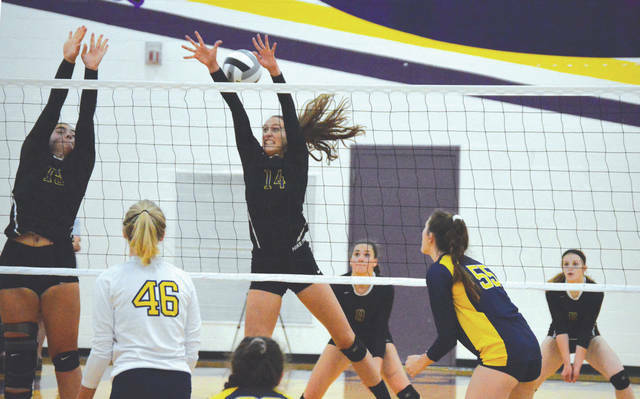 Bellbrook birthday girl Mara Neal celebrated with six kills and nine digs, and recent Case Western University signee Sara Rogers passed around 17 assists and walloped six aces. Seven other Golden Eagles players contributed at least one kill or a service ace. Bellbrook is now 9-1 overall, and undefeated atop the SWBL Southwestern at 5-0. With her dozen kills on the night, the 6-foot-3 Merkle is now tied for the SWBL lead in kills (with Monroe’s Hailey Jordan) at 115. Merkle reached that mark in one fewer game, however. Rogers leads the SWBL in service aces with 40 (with Merkle second at 38). Neal is currently third in the league in kills with 81. The Golden Eagles jumped to early leads of 8-1 in the first set, 12-1 in the second set, and 5-1 in the third, behind solid serves by Rogers and Sydney Krane (two aces). With the loss, Oakwood falls to 2-4 overall, 1-3 SWBL Southwestern. Howard voiced some concern over one of the team’s top hitters, Carleigh Crowl, who appeared to injure her shoulder while diving for a ball early in the opening set of play. The Jills’ schedule doesn’t get any easier. They take on once-defeated Beavercreek next in a non-league road match at 11 a.m. Saturday, Sept. 8. Bellbrook is done for the week. Their next match will be a 6:30 p.m. contest on Monday, Sept. 10 on the road against league foe Waynesville.